OSH, Kyrgyzstan — Helping warring ethnic communities find peace is a tall order for any broadcaster. But this is the mandate for Yntymak (the Kyrgyz word for “harmony”), a regional public radio/TV broadcaster in southern Kyrgyzstan. Madina Ulugbek presents her show in the Uzbek language. organization Internews, Yntymak’s mission is to build bridges between the majority Kyrgyz and minority Uzbek populations in this part of Central Asia. A June 2010 Kyrgyz/Uzbek conflict in southern Kyrgyzstan resulted in more than 2,000 people being killed, and thousands of refugees being displaced from both communities. 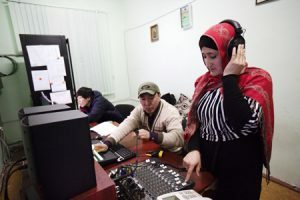 “As a result of this conflict, Uzbek language media almost disappeared from the local media landscape,” said Elina Karakulova, Internews’ Kyrgyzstan country director. Excluding such a large cultural group from vital information was unacceptable: “Having news about Kyrgyzstan in the Uzbek language for our second largest ethnic community is crucial in terms of information security, deeper levels of integration and trust among communities,” she said. Presenter Nurzada Shaidilla and Cameraman Joldubay Rustambay prepare for a broadcast. before. 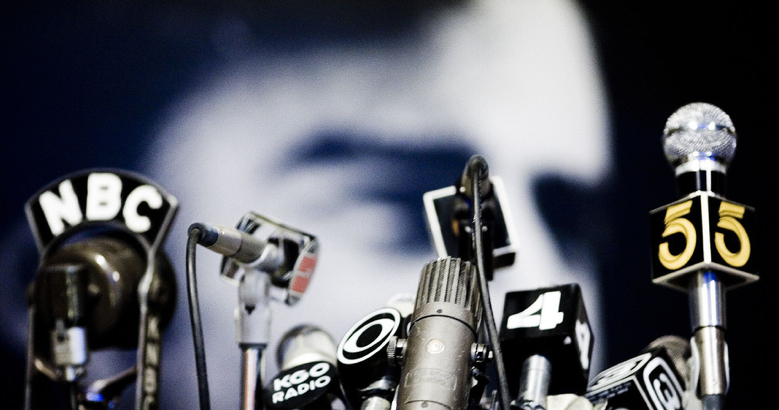 Today, the station broadcasts 24 hours, seven days a week on FM (106.1 MHz) and 17 hours a day on TV, originating from the city of Osh, where much of the Kyrgyz/Uzbek violence took place. 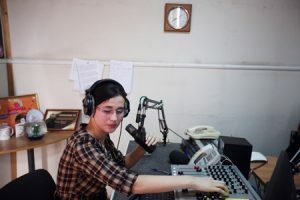 Seven years after the Kyrgyz/Uzbek conflict in southern Kyrgyzstan, “Yntymak remains the only station to broadcast programs in the Uzbek language, on both radio and TV,” Karakulova said. The station also broadcasts in Kyrgyz and Russian, in a bid to bring “harmony” to all the area’s significant ethnic groups. According to the CIA’s online World Factbook, Kyrgyzstan’s 6 million population is 70.9 percent Kyrgyz, 14.3 percent Uzbek, and 7.7 percent Russian; this last group having grown during Kyrgyzstan’s incorporation into the Soviet Union (1918–1991). 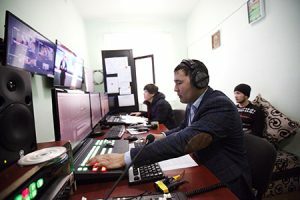 Kanybek Zhalaldin, the technical director of Yntymak, is busy in the production control room during a Yntymak TV broadcast. 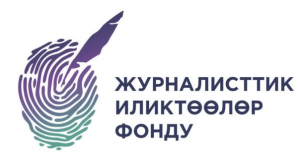 The fact that Yntymak splits its broadcast day between the major three language groups (about 60 percent in Kyrgyz, 30 percent in Uzbek and 10 percent in Russian) makes its programming understandable to nearly everyone in south Kyrgyzstan. But it is the actual content that is broadcast on Yntymak that really brings people together, because its programs emphasize inclusiveness and unity; rather than the divisiveness fostered by some other regional broadcasters. “Our FM radio station, TV channel, and website focus on human stories, local narratives and positive examples of cooperation and peaceful co-existence, as well as on themes that are of interest to the local community across nationalities, professions and social status,” said Karakulova. 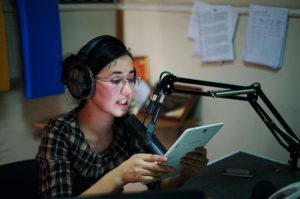 Madina Ulugbek, Yntymak’s radio presenter, works in the studio during her Uzbek-language show. Tune into Yntymak, and you could hear/see an investigative report on a local family about to lose their home due to a loan default; only to retain it and work out new terms thanks to the channel’s telling of their story. You could also see Yntymak revealing poor conditions at a local homeless shelter, which inspired donors to call the station and provide funding; or going inside a kindergarten whose derelict school is in danger of collapse. n an article for Internews’ website, Yntymak videographer/editor Azamjon Buzurikov neatly summed up the station’s intent to serve all of its ethnic audiences, a point that he repeatedly has to make to local government officials. “We tell them we cover everything from both sides, and that it is very important to have their voice in the story, too,” said Buzurikov. 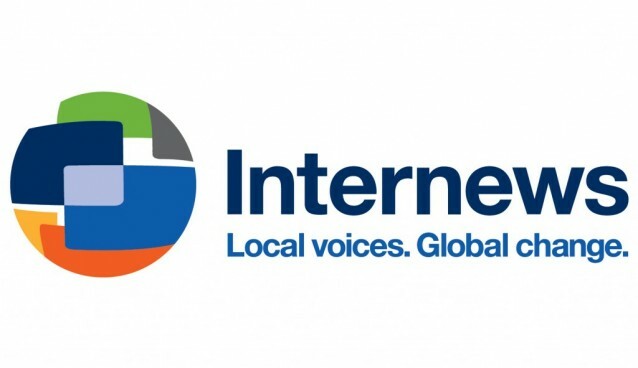 This emphasis on editorial balance is in line with Internews’ mission as a nonprofit group that helps provide people with access to trustworthy, objective news sources in their communities. Umida Mirzabaeva is the sound engineer for the evening broadcast of the Onut talk show. Of course, Yntymak’s content is not always serious. Mindful that its audience wants to be entertained as well as informed, the station runs a wide range of popular programming. This includes football (soccer) matches broadcast from around southern Kyrgyzstan and daily horoscopes. Still, the idea that Kyrgyz and Uzbek communities do better living together is never far from this broadcaster’s focus, as was demonstrated by the 2013 “We Miss You” public concert and broadcast that brought Kyrgyz and Uzbek musicians together on the same stage. Since its founding in 2012, Yntymak has made great strides in bring southern Kyrgyzstan’s Kyrgyz and Uzbek populations closer together. Azamjon Buzurikov, Yntymak’s cameraman, visits a kindergarten class at Karl Marx school. from USAID [the United States Agency for International Development]. Support has included training for Yntymak’s journalists on everything from news production and presentation techniques to election coverage and social media marketing. The USAID funds have also helped build a modern digital newsroom for the broadcaster, conduct audience research to ensure that each of its language groups are being properly served, as well as paying for the hiring and training of professional managers. Still, it is the passion of Yntymak’s 90-strong staff to serve their region’s diverse ethnic groups — and to do so fairly and objectively — that is making the real difference in south Kyrgyzstan. Granted, broadcasting alone cannot mend the wounds of intercommunal strife, but it can foster a social climate of sharing and goodwill that makes such a reconciliation possible, and more likely to occur. To this end, “Yntymak has been bridging gaps and providing a sense of inclusion for the past six years,” said Karakulova. In pursing this mission, Karakulova has learned some lessons that will benefit broadcasters who are trying to bring their communities together, rather than tear them apart. By itself, Yntymak cannot solve the ethic divide in southern Kyrgyzstan. But with the help of its staff and listeners, the broadcaster is making visible progress to heal the schism between Kyrgyz and Uzbeks. James Careless reports on the industry for Radio World from Ottawa, Ontario.